This year, the Smurfs celebrate their 50th anniversary. Creator Peyo (Pierre Culliford, 1928-1992) first introduced the little blue imps as secondary characters in his delightful comic strip Johan et Pirlouit, set in medieval times. An instant hit, the Smurfs earned their own strip and went global when animated for TV. 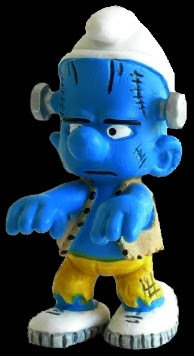 A merchandising goldmine, Smurfs figurines come in endless variations, including this Frankenstein Smurf, from 2005. 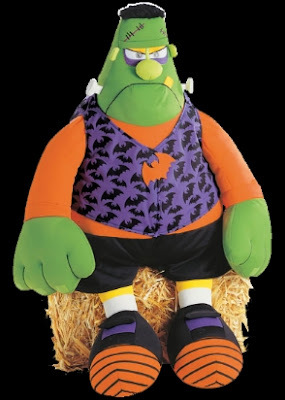 Press the nose on this big, 17-inch huggable, his eyes flash and he wishes you a Happy Halloween. For those of us who celebrate All Hallows' Eve all year round. I remember Wonderful World of Disney used to air those Whiz Kid movies back in the 70's too. I actually still have a paperback version of Vic Crume's Frankenstein and the Whiz Kid but don't remember that one ever being made into a movie or not. There is so much to cover. I have a lot of toy, animation and juvenile-related Frankenstein stuff on the back burner. I'll get around to all of it eventually! Wow, perfect for my monster-lovin' kids!